We all know Grand Canal as the home of Google but unbeknownst to many, tucked among the tech giants is a building where ancient crafts are still practised, THE DESIGN TOWER. The Tower’s seven stories of studios play host to jewellers, fashion designers, conservationists and more. 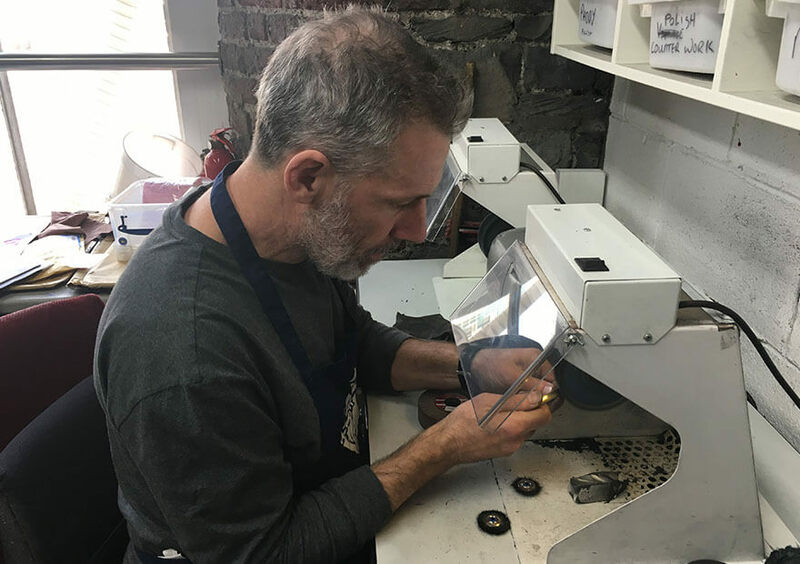 Dublin.ie is going behind the tower’s walls to meet the craftspeople working there, including Tony O’Connor of JewelleryRepair.ie. I’ve been here longer than my own house. I started my apprenticeship here in a different jewellery company. They went and I stayed on. So, I’m pretty much here since 1985. We’ve been in the trade for the last thirty years but we’ve had this business, working in repairs for the public for eight to ten years. We had both worked as jewellers before, but we saw a niche in the market for repair work for the public. Most high Street Jewellery Shops are in the business of selling jewellery not servicing or repairing it. 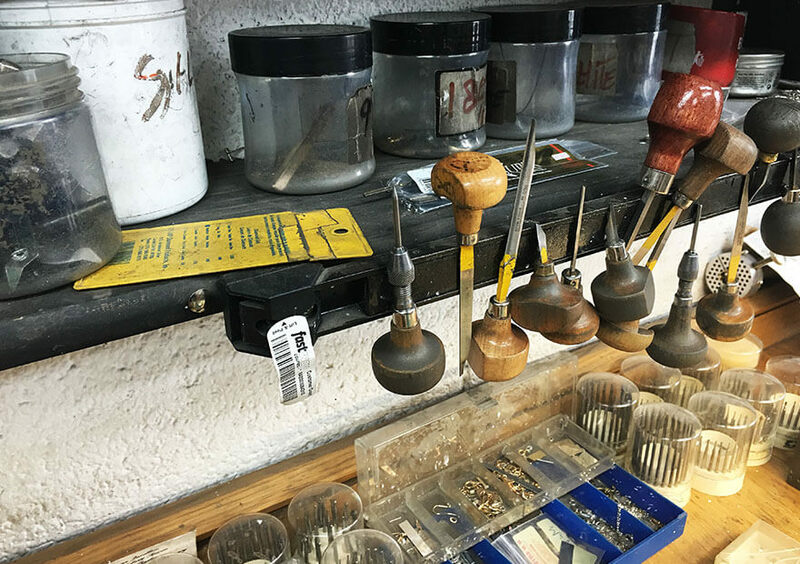 Many jewellery shops send their repairs to an outside “trade workshop jeweller” for work to be completed. That’s us! The Design Tower is open to the public and that’s perfect for us. We’re happy to have an open door policy. We want people to come in and we want to send them away happy so that they’ll send their friends and family to us. And their enemies, we’ll take them as well! Repair work can be quite rewarding. Especially if we repair something that belonged to their granny, grandfather or mother. We can restore it back to a condition that they can wear it. We don’t charge huge amounts but they go away saying they would pay any amount for it. For us that’s a great source of happiness. We’ve done a few awkward jobs. We’ve had a few requests from people where their parents had passed on and they had old gold belonging to them. We would melt it down and make something new for them. Which is what we do quite regularly. So, that was how the request came in and I said “yeah no problem”. I didn’t realise it was gold teeth. As much as we cleaned it, when we melted it down… I had to leave the windows open for the whole weekend. That was one of the more unusual requests. But the customer went away happy with their new piece of jewellery. We also create custom pieces. There was a girl who came in yesterday. And I don’t know whether it was a combination of the tablets I’m on for my sore back or, her contagious laughter… We made a wedding ring to fit her and she just burst into laughter with delight. And of course, it got me going. The two of us were like a pair of hyenas laughing. She went away absolutely over the moon. When that happens, it’s fantastic. For more information on the Design Tower visit WWW.THEDESIGNTOWER.COM. Amy Sergison works in the advertising industry, creating social and digital content for brands in Ireland and the UK. The child of inner-city parents, Dublin is in her blood. When not writing you can find Amy screaming at a rugby match, Instagramming her dinner, or searching for solace in the quiet spots of the city.